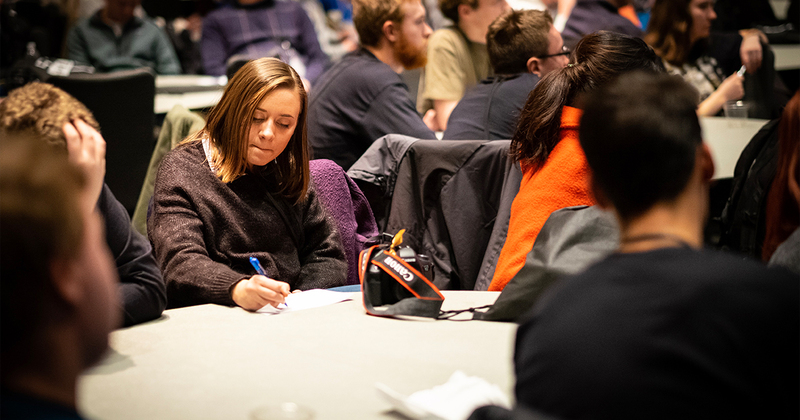 The thought of college students on winter break tends to call up images of ski trips or warm-weather getaways, but 330 students, campus ministry pastors and workers from over 80 campuses spent part of their break at the LCMS U “Witness” conference in Fort Wayne, Ind., Jan. 2–5. In addition to learning about a framework and tools for sharing the Gospel, they gave $1,404 in support of The Shepherd’s Hand, a community-outreach initiative of Shepherd of the City Lutheran Church, east of downtown Fort Wayne. Shepherd of the City is also home to an LCMS U chapter for students attending neighboring Indiana Tech University. 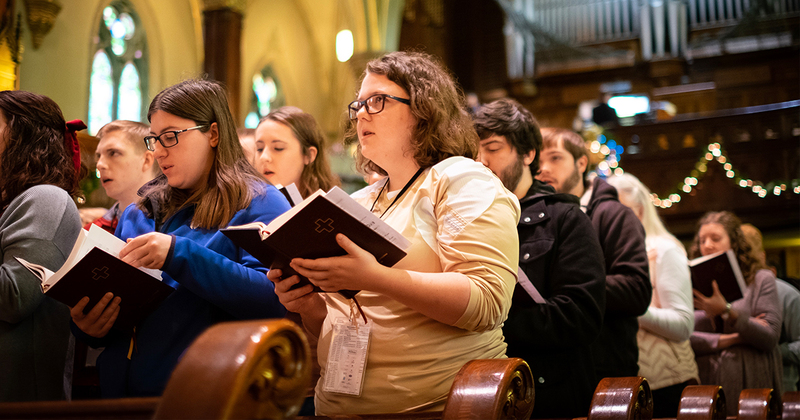 The conference, which took place on the campuses of Purdue University Fort Wayne and Concordia Theological Seminary (CTSFW), Fort Wayne, offered dozens of sectionals, plenty of opportunities for fellowship, and worship at CTSFW and St. Paul’s Lutheran Church, Fort Wayne. The foundation of the conference was several sessions with keynote speaker Rev. Dr. Mark Wood, director of LCMS Witness & Outreach Ministry. Wood built his presentations around Every One His Witness®, a Lutheran evangelism tool developed by the LCMS Office of National Mission and available from Concordia Publishing House. “The focus of the plenary sessions was to give the attendees greater insight into what went into the development of Every One His Witness. I hope this will encourage those who haven’t participated in a workshop to do so and that it will give those who have participated in a workshop a greater depth of knowledge,” explained Wood. Nathaniel Prather, a junior at Indiana University, Bloomington, Ind., thinks the LASSIE approach (Listen, Ask, Seek, Share, Invite, Encourage) from Every One His Witness will be a great tool for his own witnessing efforts. 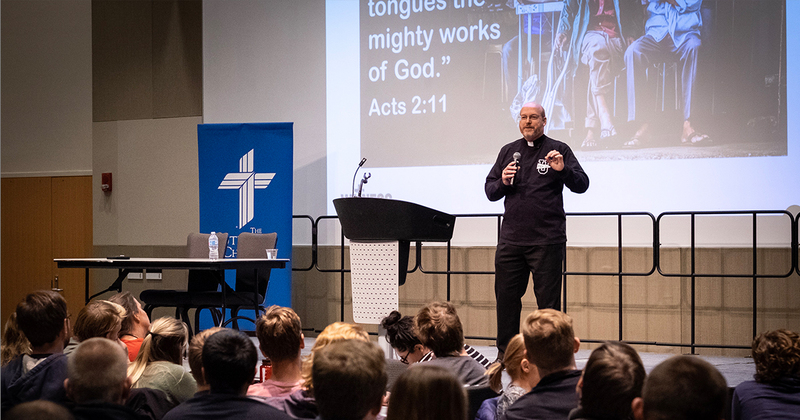 “College students are blessed to have the unique opportunity to share the Gospel with people of very diverse and interesting backgrounds,” said Prather. “There is no other place on earth that I know of where an individual can step outside his or her door and find people from all around the world waiting to hear the Good News. The sectionals at the conference covered topics concerning witnessing to those with varying worldviews, witnessing and dating, and spiritual warfare. One theme that hit home for many of the participants was witnessing to those in pain. “Although every sectional I attended impacted me in a wonderfully different way, the sectional that gave me exceptional help was from Rev. Seth Mierow’s session titled ‘The Problem of Pain: Witnessing to Suffering Agnostics,’” said Emily Kleman, freshman, Indiana University, Bloomington. Mierow, pastor at St. Peter Lutheran Church, Indianapolis, serves Butler University along with other university campuses in the city. With so much teaching, learning and sharing packed into just a little over 60 hours, what’s the takeaway from LCMS U “Witness”? “I do think Christians in college want to be a witness for the hope that they possess; they simply may not be equipped with the knowledge, tools or confidence to do so,” offered Harsin. “I know this is true of me. “Witness” was the fourth biennial conference hosted by LCMS U, with the fifth being planned for January 2021. To learn more about the campus ministry of LCMS U and future conferences, visit lcmsu.org and facebook.com/lcmsu, or send an email to marcus.zill@lcms.org. Jayne Sheafer (sheafer88@gmail.com) is a writer and editor in Fort Wayne, Ind.